Through Cornell Orthotic & Prosthetics, you have the chance to regain your mobility with our unique blend of science, art, and compassion on offer here at one of the top prosthetics companies in the entire nation. We have a passion for helping our customers solve their unique needs with specialized care that is personal, comforting, and advanced. Our patients range from newborns to centenarians and come from a variety of backgrounds — each with their own need. Science – Whether you are looking for an orthotist or a prosthetist, we offer both orthotics and prosthetics that are sophisticated. Our staff boasts leaders in the industry with years of experience and education to back it up. Art – Your life is your art, and because we understand that you are more than your appearance or even mobility, we want to make sure that you are equipped for holistic success after walking through our doors and receiving our services. Compassion – We were founded by Keith and Ken Cornell in 1985 with the vision of providing caring services that put the patient’s needs and wants above all else. With each interaction we have, we seek to fulfill these goals. We want to be a part of the growth and wellness of everyone who is a patient at Cornell Orthotics & Prosthetics! In addition to what we’ve described above, many folks choose us because of our deep-rooted bond with a multitude of Boston-area schools, rehabilitation centers, doctors, hospitals, and clinics. Our practitioners visit these locations frequently in order to make sure we are doing everything in our power to coordinate ideal care plans for our patients. That’s just one more way we set the bar here at Cornell O&P. 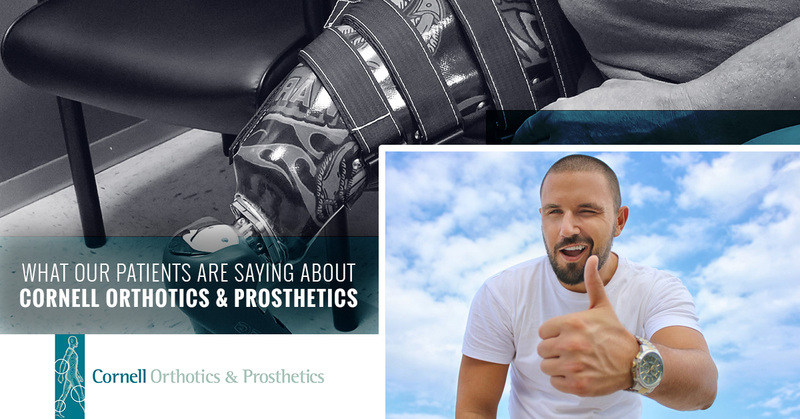 Today’s post is less about us singing our own praises (we beg your pardon, for we are passionate about the work we do) and more about letting our past and current patients express what they appreciate about our local prosthetics company. To be completely frank, there isn’t a better thing we could do within this blog space, as far as we are concerned, than to let our patients do a bit of marketing on our behalf. At the end of the day, these are folks who were once in the same shoes as our current readers — being prospective patients themselves. What’s more, we cherish the testimonials we receive because it speaks to our commitment and passion that we have made a core part of our mission. When we are able to impact the lives of our patients to the extent that they are compelled to tell the world about the quality of care they received, it makes us feel pretty good about ourselves! We hope you find these reviews enlightening. Nicole, thanks for taking the time to share your experience of being a patient here at Cornell O&P. Mike Domenicucci, one of our Certified Prosthetists on staff, really is the greatest, we agree! The fact that you felt welcome and comfortable means a lot to us, and we hope that you continue to experience the wellness you were able to achieve with our help! Beth, thanks so much for letting us and others know about the level of care we provide. We also appreciate the kind (and accurate) adjectives you used, such as “highly skilled” and “state of the art.” We hope you are continuing on your wellness path! Speaking of great descriptors, getting described as “creative, compassionate, funny, and caring” is never a bad thing — although we can’t say we are surprised that such words are being used to characterize Dr. Keith Cornell, CP, FAAOP, and president of Cornell O&P. He was elected to the American Orthotic & Prosthetic Association board of directors in 1999 and served as president in 2004, in addition to being the inventor of the patented CJ Socket! Liz, we are so happy you walked through our doors. Thanks for your trust and kind words. We want to make sure your physical needs are satisfied along with your emotional needs as well. That’s why we make sure you are well taken care of here at Cornell O&P. That looks like being communicative and intentional every step of the way, so that you understand your options and are empowered to make an informed decision about your future. Thanks, Dave, for highlighting that. Anthony, we really appreciate the review, although not as much as we appreciate you walking through our doors and putting your mobility in our hands. Whatever questions our patients have, we are patient and understanding. Your comfort, empowerment, mobility, and general wellness are our priorities while we work with you. With locations in Beverly, Peabody, and Danvers, we are never too far of a drive away from most folks who live in the Boston region (and beyond!) We’d love to hear from you and see how we can meet your unique needs in a professional and caring way.